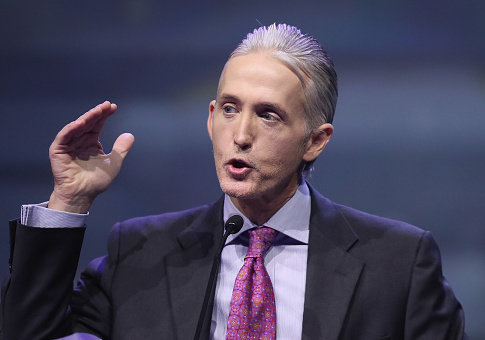 The Republican Steering Committee on Thursday supported Rep. Trey Gowdy (R., S.C.) to become the next chairman of the House Oversight and Government Reform Committee. If confirmed by the full Republican Conference, Gowdy would become a leading figure in the probe into President Donald Trump's decision to fire FBI Director James Comey, Politico reported. Gowdy would replace outgoing Oversight Committee Chairman Jason Chaffetz (R., Utah), who will resign at the end of June. Rep. Steve Russell (R., Okla.) had also put his name in for consideration to replace Chaffetz. House GOP leaders encouraged Gowdy to run upon learning of Chaffetz's looming departure. He is a close ally of Speaker Paul Ryan (R., Wis.) and Majority Leader Kevin McCarthy (R., Calif.) on a panel comprised of unpredictable Freedom Caucus conservatives with rocky relationships with leadership. Gowdy has also clashed with Trump, although he later served on Trump's transition team. Trump once re-tweeted someone calling Rep. Trey Gowdy a "Benghazi loser" after Gowdy backed Sen. Marco Rubio (R., Fla.) in the GOP presidential primary. Trump also accused Gowdy of being soft on Hillary Clinton over her use of an unauthorized email server. NBC News producer Alex Moe tweeted Gowdy's statement on Thursday after the steering committee elected him to serve in the position. "Trey Gowdy possesses the experience and deep commitment to transparency and accountability necessary to be the House’s next Oversight chairman," Ryan said in his own statement. "He has proven that he will always look out for taxpayers and seek answers from the bureaucracy." This entry was posted in Politics and tagged Donald Trump, FBI, House Oversight and Government Reform Committee, James Comey, Jason Chaffetz, Trey Gowdy. Bookmark the permalink.